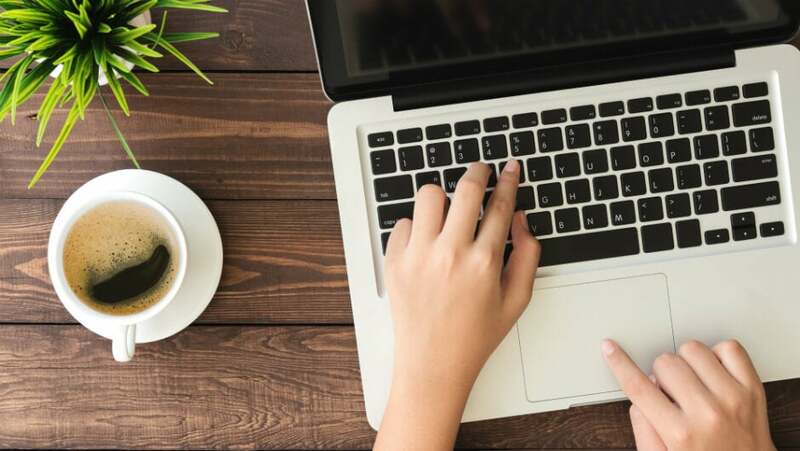 Designers need powerful and portable laptops with long battery lives to run programs such as Photoshop or Adobe Premiere Pro while running between pitching meetings or working on-the-go. We pick out the best laptops for designers, plus explain the specs and budget you’ll need to consider. Above all, buying a laptop for design work isn’t cheap. If you’re going to break the $1,000 mark (or even the $2,000 one) it’s essential to know you’re buying a laptop that won’t let you down. Our best laptops for designers combine powerful specs with attractive looks and thin, portable frames. Verdict The ultimate designer laptop, offering plenty of power and a gorgeous screen. It’s a popular choice for good reason Portable, and with a sketchable touchscreen, although Surface Pen costs extra. A great option for Microsoft fans The smart choice for designers on a budget, this Pro ditches the fancy Touch Bar but is still a solid choice. Excellent 15 hour battery life makes it a great companion, if a little pricey Compact, but with a handy stylus, multiple ports and an outdoor mode that increases screen brightness. With its folding screen and three pound weight, not to mention the 15 hour battery life, the Yoga 920 is great for travelling designers The 1TB hard drive offers loads of storage, and the solid state drive means snappy start up times. It’s chunky, but offers lots of ports and features. What Computer Specs Do You Need for Graphic Design? Which MacBook is Best for Graphic Design? What's the Best Laptop for Drawing? Are Gaming Laptops Good for Graphic Design? It had to be the MacBook Pro, didn’t it? The ubiquitous choice for coffee shop workers and creatives everywhere, the MacBook Pro packs incredible power and class-leading screen displays into a sleek, metal frame. MacOS has long been preferred to Windows in the design world. It’s a cleaner operating system that’s less prone to crashing under high workloads and can easily run multiple, power-hungry programs at once. One downside to the MacBook Pro is the scarcity of port options it offers. You’ll be getting four Thunderbolt 3 ports (which are compatible with USB-C connections) meaning you’ll likely have to bring along a bulky dongle to connect with the more widely used USB-A ports or HDMI cables. The MacBook Pro range consists of several different models, from the entry-level 13-inch 2.3GHz Dual-Core model, to the 15-inch 2.6GHz with touchbar. Naturally, it’s this one that costs the most cash, but the touchbar, while cool, isn’t essential for designers, and you can save yourself some money by buying the standard model. While the Pro range is the priciest in the MacBook line-up, be warned. The MacBook Air and 12-inch MacBook lines may look slim and pretty, but they’re underpowered for creative work. The entry-level MacBook Pro, perfect for budding designers that want the power and style of a MacBook, but not the expense of one of the Touch Bar models. It may have an older processor, but it will still serve all but the most demanding of designers. Who needs a Touch Bar, anyway? The ‘cheapest’ MacBook Pro with the Touch Bar. The 8th gen processor and extra storage give it a considerable boost over the entry-level model above. It’s a good choice for those who need power and have the budget to spare. The ultimate, blow-out MacBook Pro, this is the one to go for if money is no object. With a super-fast processor and loads of Ram and storage, the only limit to your designs will be your imagination. Best for designers looking to make a serious impact, or with access to the company credit card. 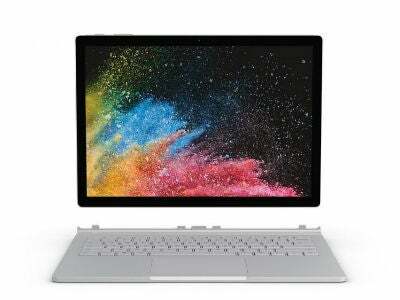 Originally positioned as Microsoft’s MacBook-killer, the Surface Book 2 is now in its second generation. It’s retained the reversible and removable touchscreen from the first-gen model, meaning you can use it as a tablet or as a traditional laptop. The Surface Book 2 also adds some newer components (including an 8th gen i7 processor) into its slick, but slightly utilitarian chassis. You can configure the Surface Book 2’s components to your liking, but we wouldn’t recommend anything less than an i7 processor and at least a 256GB SSD for creative design work. The Surface Book’s touchscreen does offer some advantages over the non-touch MacBook Pro – it’s great for sketching or annotating documents or images using Microsoft Ink. The optional Surface Pen irritatingly costs an extra $99, but it’s more precise than your humble index finger and allows some neat tricks such as shading. 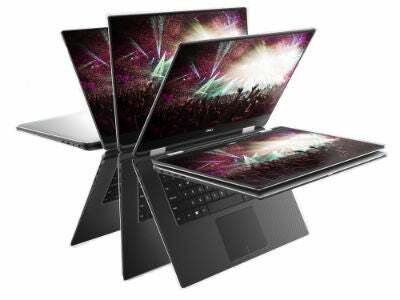 Dell claims its XPS range of laptops is built to be the best – and even a quick glance at the XPS 15 2-in-1 will attest to this. This is the top-end of Dell’s range, packing all of the latest components and tech into a tiny package. The XPS 15 2-in-1 feels closer in size to a typical 14-inch laptop, but it packs a full 15-inch screen with hardly any bezel and a slim frame. In fact, it measures less than two-thirds of an inch deep at the thickest point. But don’t think that its slender frame, power-hungry i7 processor and AMD graphics card will lead to a short battery life. Dell claims a remarkable 15 hours and 53 minutes with the 1080p display. The XPS 15 2-in-1 weighs less than four-and-a-half pounds, so it’s unlikely to give you back pain on the way to your next pitch. Considering the i7 models of the XPS 15 start at just shy of $1,700, it’s not ideal that you have to pay another $150 for an upgrade to a 512GB SSD – we’d expect more storage at this price. 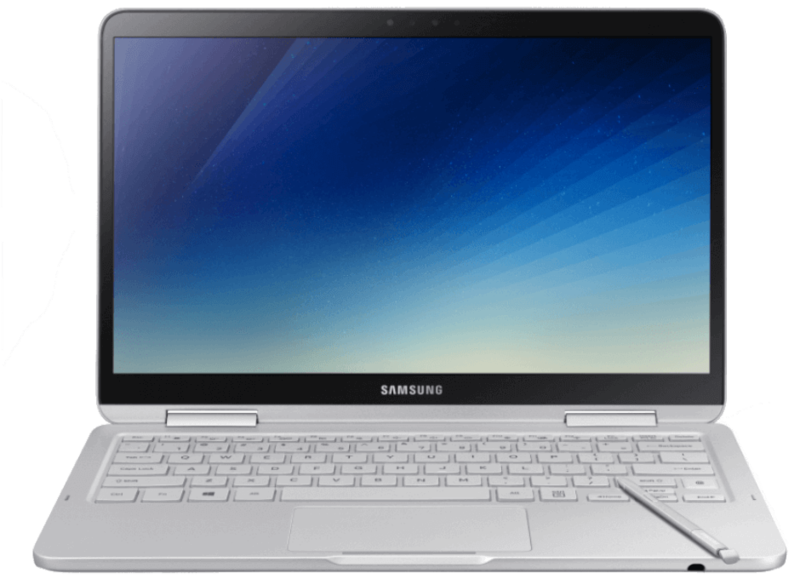 Samsung’s 2018 version of the Notebook 9 is the newest laptop on this list, only coming to market in February. As such, it packs in all of the latest features available to Windows laptops, including a fingerprint scanner, Windows Hello facial ID login, stylus support (hence the ‘pen’ naming) and an HDR-ready display. It’s the littlest laptop on this list, with a 13.3-inch display. But, it still squeezes in two USB-C ports, a USB-A port and an HDMI port. It also has a neat outdoor mode that nearly doubles the brightness from 350 to 500 nits (that’s a good thing!) to permit easier outdoor working. Unfortunately, the Notebook 9 Pen is limited to just a 256GB SSD for storage – we’d expect a bit more, or at least a choice at this price point. So, you’ll need to be very judicious with file storage, carry around an external hard drive or invest in a cloud storage provider to atone for the Notebook 9’s lack of storage. The Lenovo Yoga 920 comes in an unusual 13.9-inch screen size and has a unique “watchband” style hinge to connect the rotating screen to the keyboard – you’ll certainly stand out between the lines of MacBooks in the coffee shop. Don’t think it’s all style and no substance, however. The hinge also houses the WiFi antenna and the laptop’s air vents, allowing for a completely flat and smooth design. The Yoga 920 tips the scales at a just over three pounds, and given its mere half-inch thickness, this is a great laptop for use on the go. The battery life almost matches the Dell model, above, with Lenovo claiming 15 hours and 30 minutes use with the 1080p display. However, with this laptop’s remarkably slight frame and impressive components, something had to lose out – the ports. You do get a USB-A port (unlike the MacBook Pro) but only two USB-C ports. HP claims that the Spectre x360 “transcends” expectations. 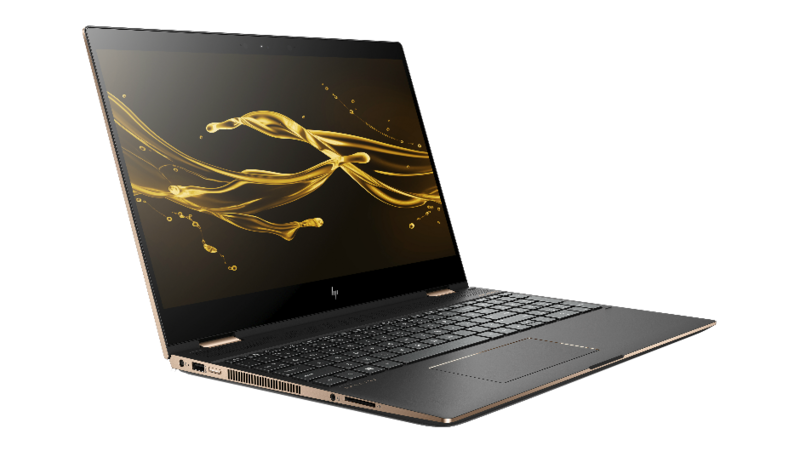 A big claim, but this is a very impressive laptop from HP’s ‘prosumer’ sub-brand. It isn’t quite as slender as Dell or Lenovo’s offerings, but the x360 throws in a stylus for free, unlike the Surface Book 2. It also features a combination hard drive, unlike the other laptops in this list. This means you have a copious 1TB traditional spinning hard drive plus the faster boot and load speeds of an SSD. It’s a better value approach than paying over the odds for a large 512GB or 1TB SSD. The Spectre also comes with a cornucopia of ports compared to its rivals, with a Thunderbolt 3, a USB-C, a USB-A and an HDMI port. So, if you aren’t quite ready to commit to a dongle-led future but don’t fancy a chunky workbook, this might be your perfect laptop. As you’re likely to be using power-hungry programs for creative work, it makes sense to pay more for a powerful processor. After all, the less time you spend waiting for your computer to catch up, the faster you’ll finish working. You might also see processors referred to as CPU (central processing units) or, simply, chips. AMD and Intel are the two names in town when it comes to processors. These days, there’s little distance between the two brands, and both put out some high quality processors for top-end laptops. For design work, you should accept nothing less than an Intel Core i5 processor (with i7 being preferable), an AMD Ryzen or AMD FX chip. You’ll also want a decent amount of RAM – 8GB at least, but 16GB is a good bet these days. RAM stands for random access memory – it helps your computer navigate its way through your files and tasks. Again, the more RAM your computer has, the faster you’ll be able to get your jobs finished. Also – don’t confuse memory, meaning RAM, with storage, which is your hard drive or solid state drive. There are also two types of storage used in premium laptops: spinning hard drives, or solid state drives (SSDs). A spinning hard drive is older, but not obsolete tech – they tend to be cheaper and have more storage space than SSDs of the same price. They also literally spin around, creating noise, friction and heat. SSDs on the other hand, are newer – and more expensive – than spinning drives. They have no moving parts, helping the computer to read and write data much faster. With an SSD, your laptop will boot up more quickly, and run and open programs more smoothly. The only downside is you get much less storage space with an SSD. Graphics cards, or GPUs, are similar to processors, but work in a slightly different way. Graphics cards are better at representing things on-screen. Some cheaper computers eschew a discrete graphics card in favour of letting the processor manage all the tasks – but for the work you’re going to be doing, you’ll need a dedicated GPU. A larger screen can also be helpful – there’s no point in peering into a tiny display when you’re designing a multi-million dollar ad campaign. Think 13-inch as a minimum, with 15-inch being preferable. These are very demanding specifications and you shouldn’t be surprised by prices over $1,000 or even over $2,000. Apple currently offers three MacBook lines. The slimmest is simply called ‘MacBook’ (a 12-inch screen model), the slightly outdated ‘Air’ range sits in the middle (13-inch screen) and then there’s the top-of-the-line Pro range (available in 13-inch or 15-inch). As a graphic designer, you’ll need to get a Pro. Simply put, the MacBook’s 12-inch screen is too small for any serious design work. Don’t get us wrong, it’s a great laptop, but just not the right fit for graphic design work. Beyond that, the processor in the 12-inch MacBook is underpowered for the work itself. The MacBook Air, on the other hand, has a more acceptable 13.3-inch screen, and has also recently been granted a refresh which has finally updated its ageing 5th gen Intel processor to a more modern 8th gen one, as well as othter improvements, such as a retina screen. However, it lacks the raw power that most designers will demand for their work. The Pro line, therefore, is the only viable option if you’re after a MacBook for design. It’s available in two screen sizes, 13.3-inch and 15.4-inch screens offering 2560×1600 and 2880×1800 pixel resolutions respectively. The Pro line is also significantly more powerful than either the Air or regular MacBook lines, with 8th-gen processors and better graphics cards. The 13-inch model has an Intel Iris Plus 655 GPU, and the 15 inch will give you a choice between the Intel UHD 630 GPU or two AMD Radeon units. With the Pro line, you’ll also have access to more USB-C ports, four in total, which makes adding peripherals like an external drawing pad or hard drive less of a pain. What’s The Best Laptop for Drawing? Four of the laptops we mentioned above come with a touchscreen – the Surface Book 2, Samsung Notebook 9 Pen, Lenovo’s Yoga 920 and the HP Spectre x360 15. A stylus allow you to draw on each laptop’s touchscreen with ease, and some, like the Surface Book’s stylus, allow for more versatility than just drawing lines: you can shade, for example, by tilting the pen as you draw. 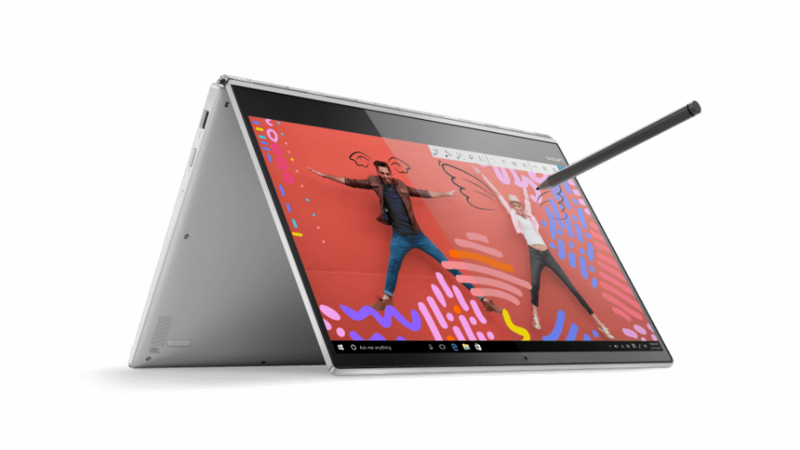 However, the Surface Book’s stylus isn’t included in the price of the laptop, unlike the other three models. So, unless you know you’re going to use it extensively, it might not be worth the investment. Should you have your eyes on a laptop sans stylus, but need drawing functionality, it’s worth remembering that you could invest in a drawing pad (or graphics tablet, as they’re also known) that will work with all laptops. They can cost as little $25, but really, you should be looking to spend closer to $100 or more to get a quality pad. 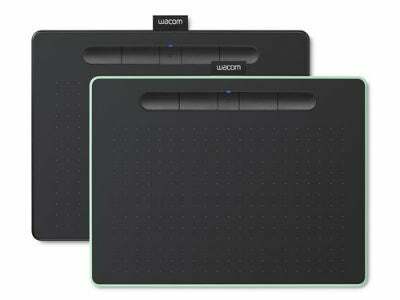 Wacom is the market leader when it comes to graphics tablets, and its Intuos range (pictured) starts from $80. The tablet pads will also typically be better for serious drawing than using a stylus straight onto a glass touchscreen. They have different levels of pressure sensitivity, allowing you to sketch and shade with ease. Are Gaming Laptops Good for Graphics Design? Graphic designers need powerful laptops with big screens, and so do gamers. So, can you kill two birds with one stone and get a single laptop for both jobs? Well, sort of. Any tasks you need to perform for graphic design you’d be able to do on a gaming laptop. However, when it comes to gaming on the machines in this list, you’ll be slightly lacking in the graphics department. In order to process the high graphical demands of modern games, laptops need to have powerful discrete GPUs, and these require serious cooling to work effectively. As a result, gaming laptops tend to pretty chunky and throwing one into a courier bag before heading off to work is likely to leave you with a sore shoulder – although the new Razer Blade Stealth is a notable lightweight exception. 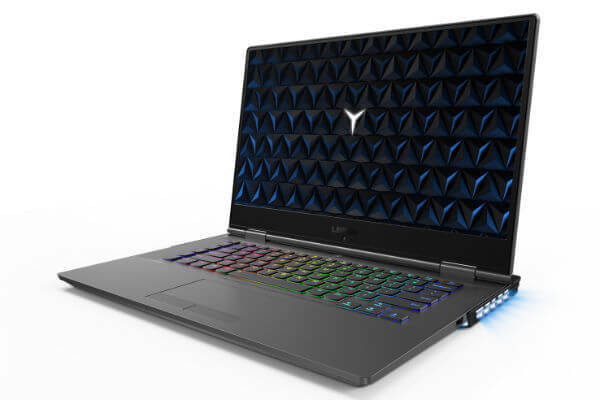 Gaming laptops typically feature some pretty garish designs – like the Lenovo Legion Y730, pictured. So, pulling out a laptop like this in a pitching meeting might not make you look particularly professional.